Solar Shirts are Sun Activated™ Custom UV color changing shirts. True Love Birds magically changes color when exposed to the UV rays of the sun. Indoors the design is outlined with solid color ink, and then when exposed outdoors the solar colors appear. 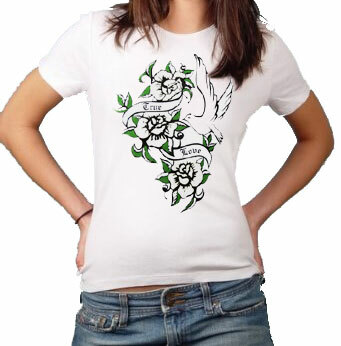 True Love Birds is printed on machine washable, 100 % cotton style tees. The Solar colors are vibrant and exude strong depth of color that will continuously change colors over and over again. Explosions of color instantly show when you walk outdoors and makes everyone look twice at your color change shirt. Shirts that change color are like getting two tee shirts for the price of one!